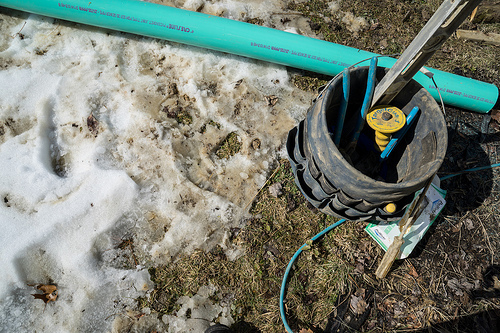 Over time, the main sewer line, connecting to the home, can clog over time, often due to routine use or problems outside such as a nearby tree root invading the line. No matter the reason, a clogged main sewer line, if ignored, will lead to major problems, meaning you will want to get it resolved as soon as you can, and while you can do the job on your own with some products, these products often do not work with larger jobs, which, as you already guessed, means you have to call a professional. The cost of a sewer line cleaning will greatly depend on the plumber you hire, your circumstances, geographical region and the method your plumber uses. As we discuss in depth below, a plumber will often use two popular methods, which, most of the time clear and cleans out the sewer line. A simple auger job can cost as little as $100 to $250, whereas a high-pressure cleaning can cost anywhere from $275 to $550. While most jobs are fairly straightforward, it doesn’t hurt to receive multiple quotes from local contractors as the plumbing industry is a competitive field. What you may find out is that a local plumbing service may be offering a special deal and/or coupon, which could drastically decrease the cost. For that reason, we recommend you check out HomeAdvisor.com, a tool where you can state the job you want and with that information, contractors will contact you with quotes for free. No credit card is required and you can receive quotes within the day. Hourly rate: In some circumstances, a plumber will either charge by the hour or by the job, depending on the circumstances. As the hourly rates will vary across the United States, often based on geographical location and the expertise of the plumber, the hourly rates can range from $50 to $150 an hour. Blockage severity: All sewer line clogs will not be created equally, and the severity of the clog can affect the total cost. If the plumber, as we noted above, can resolve the problem at hand with an auger, it would be much cheaper than a line which requires a high-pressure hose. As we talk about later, a plumber will either consider using an auger or a high water pressure hose, in some cases, there are times these two options do not work. If this was the case, then you will need to be prepared to spend more for a “more involved” process, which could include a video inspection (about $250 to $550), which works by placing a small camera on an auger and inserting it into the line or in the case of tree roots protruding through the line, the entire sewer line may need to be replaced. Emergency repairs from 24-hour services can often increase the costs by more than 30-50%. What’s included in the estimate? Typically, a plumber will first want to come your home and analyze the situation, usually be asking questions about the clog, what you have been experienced as well check out the situation, both visually and by smell. Then, once he or she finds the drain in question, they will go to the outside of the home and find the fitting which connects to the main sewer line. Opening up the sewer line, they will either use the auger or a high pressured hose, depending on their recommendation. In our next subheading, we will talk about the most common ways plumbers often clean out a sewer line. After the process is complete, to test if it was successful or not, the plumber will often check the drain in question to see if the gurgling sound, smells and/or standing water disappears in the drain. Most reputable plumbing services will offer a limited warranty which will protect you for the next 30+ days in case the same problem arises again. How will a professional clear the sewer line? To get rid of a clog in the sewer line, a plumber can use a variety of methods. One method, often being the most common, is via a drain auger, also referred to as a drain snake. This long flexible cable, usually made of metal, will come in varying lengths, but a plumber-designed snake can reach as far as 50 feet or longer so that a majority of the clogs in the main line can be cleared. As the snake is inserted through a drain, often through the fitting located just outside of the home which is connected to the main line, the auger will be able to break up the clog in a few minutes. With this process, however, keep in mind that it isn’t a “cleaning,” per se, but rather, it will break up whatever debris was blocking the drain in the first place. To actually clean the line and get rid of any blockage in the path, then the plumber almost always uses a high-pressure hose in order to get rid of the clog and any residue that has built itself up on the walls of the sewer line. Commonly referred to as a water jetter, the process will cost more than using the auger, but it can work better and the effects can last longer for years to come. Sewage backup in drain: One of the most obvious signs will be waste or sewage coming back into your drains, often creating unwanted smells. Gurgling or pieces of tree roots: Aside from the backups in the drain, additional signs can arise before the entire line clogs, including an odd gurgling sound coming from the drain if it never made the sound before, or if you live in an older home with larger trees nearby, then pieces of roots will start to show up in the toilet or drain, meaning as the older pipes start to collapses, the pieces of the roots are able to protrude the space and show up inside of your home. As the water comes through the drains inside of your home, the pieces of the tree root will come along with it. Strange smells without symptoms: Even if you’re not seeing any of the signs mentioned prior, a strange smell, even without the signs of roots or the backup of waste/sewage, can potentially mean a main sewer line clog. If your contractor plans on using the jetting method, make sure they have a camera on hand so you can view the results after the job is complete. It’s not uncommon for these jets to miss some spots as the jet is pulled back, either not cleaning the top or bottom as well as it should. By viewing the camera alongside the contractor, you can be assured your sewer lines are cleaned 100 percent and they will not have to come back to the job site in the future.